Posted by pacejmiller in Food, Taiwan, Travel. Location: See here — the two with English addresses are the full restaurants (the others don’t serve the full menu). I went to the one on level 11 of Fuxing SOGO, which is easy to get to on the MRT blue line at the Zhongxiao Fuxing stop. Price: For dim sums, probably around NT500 per head, more for main courses. While attending another Taipei restaurant (which I will review shortly), I came across a restaurant guide book called “Taiwan Coumet Restaurant Evaluation and Selection 2010”. 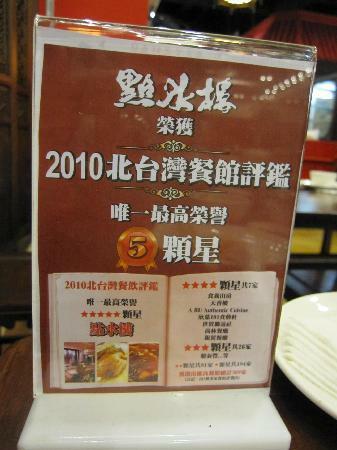 In it, there was only a single restaurant that had been awarded the prestigious 5-Star honour, and it was called “Dian Shui Lou”. Fortunately for us, there were several Dian Shui Lous in Taipei City (though be careful, some of them don’t serve the full range of cuisine), and we ended up going to the one on the 11th floor of the Fuxing Sogo Department Store (probably the easiest to get to by public transport).